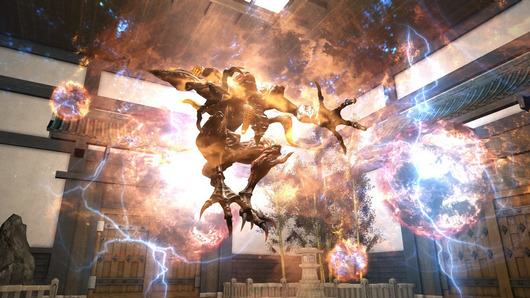 With the release of FFXIV Patch 4.35, Heaven-on-High is an ever-changing dungeon whose architecture is never quite the same each time players enter the tower. All players will begin at level 61, and only by fighting the enemies within will they be able to gain the strength and experience needed to explore its heights. Players will start at level 61 regardless of their current class or job level. By defeating enemies that appear in the dungeon, players will be able to gain EXP and level their characters up to 70. Your Heaven-on-High level is not directly related to your level outside of the dungeon. Players will be restricted to the use of an empyrean aetherpool arm and empyrean aetherpool armor when inside Heaven-on-High. In addition to gaining levels, players must enhance these items as they progress through the dungeon. Note that empyrean aetherpool armor will take the appearance of your current gear upon entering the instance. * Normal gear has no effect on your character's attributes inside Heaven-on-High. * Aetherpool gear strength will not carry over from Palace of the Dead. Start from floor 1 or floor 21 with a fixed party and clear up to floor 30. Party KO count must be zero. Save data with one or more party KOs cannot be used on floor 31 or higher. * Please be advised that the party KO count will also increase in the event your party abandons the duty or logs out while inside the instance. * In the SSEGOLD.COM use coupon "YTB" can enjoy a 5% discount, the price itself is the lowest price can discount.